The American political experiment spawned many liberation movements throughout Europe, as people naturally embraced the idea of the right to self-determination. It began with France, first with the Revolution in 1789 and again after the fall of Napoleon, spreading to Naples, Greece, Belgium and Poland. As the old Spanish Empire crumbled, the Latin American Republics were also created in this spirit. The chaos in Europe attracted many immigrants to the dynamic, energetic and relatively peaceful United States. One of these was John Reich, a German engraver caught up in the Napoleonic Wars. He paid his way to America through indentured servitude and pursued his calling as an engraver by applying for a job at the U.S. Mint in Philadelphia. He was hired in 1807 and was given the task of creating new coinage designs. Reich brought Europe to America. His obverse design shows Liberty facing left, surrounded by 13 stars, with the date below the bust. Liberty is quite buxom, and though characterized in the press as looking like "the artist's fat mistress," she is probably representative in appearance of the typical woman that Reich would have seen in Europe. Contrary to the opinions of some students of U.S. coinage, she is not wearing a Phrygian liberty cap but simply a mob cap, with a band inscribed LIBERTY. Many took issue with the idea that Liberty would be adorned with a cap given to freed slaves, but even President Thomas Jefferson saw this headdress, with its high cap bearing frills and ribbons, as familiar wearing apparel of women during this time. The bucolic Miss Liberty was quite different than the stern, no-nonsense look of the preceding Robert Scot, Draped Bust design. The reverse shows an eagle with outstretched wings perched on a branch and holding three arrows, the Union Shield on its breast and the motto E PLURIBUS UNUM ("One made up of many") on a scroll above the eagle. The words UNITED STATES OF AMERICA and 25 C appear around the border. The eagle is more domesticated and peaceful looking than the aggressive Heraldic Eagle of the 1804-1807 design and more robust than the puny eagle on the 1796 quarter. The Reich design would follow the policy established by the first director of the Mint, David Rittenhouse, that one design would be used on all coins of the same metal. 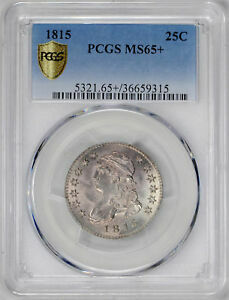 It was first rendered on the half dollar of 1807, the dime of 1809 and finally the quarter in 1815. 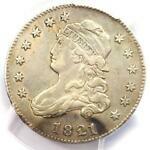 There were no quarters minted from 1808 to 1814, primarily because there was little demand for them. Early quarters were victims of Gresham's Law. This economic axiom dictates that if two competing currencies exist side by side, the least valuable will be spent and the other will be kept. In other words, "bad" money drives out "good." The competing Spanish 2 reales coins were legal tender at par with the heavier quarter, so the quarter coin was either hoarded or melted for its silver content. The Spanish coins satisfied the needs of commerce, so there was not much need or motivation to make large mintages of U.S. coins. Quarters were only minted in 1815 because the banks had ordered them. In fact, the majority of the mintage of 1815 went to the Planters' Bank of New Orleans. Just over 89,000 pieces were made, including approximately 20,000 pieces delivered on January 10th of 1816. A fire at the mint the next day destroyed much of the equipment, shutting down production of quarters until 1818, but nobody missed the coin. Though the design was criticized, it represented a technological improvement over the Scot Heraldic design. There were far fewer design elements that had to be worked in by hand, reducing the time necessary to make a working die and increasing its useful life. The dies and therefore the coins were more consistent, making it easier to detect counterfeits. Relatively low mintages were the rule for this series, with production for the 11 years totaling only 1,290,584 pieces. 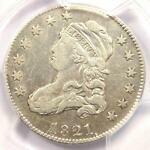 While VG to VF pieces are easily obtainable, uncirculated pieces are scarce or rare. Assembling a complete date set is precluded by the two major rarities, 1823/2 and the proof-only 1827, but strong demand comes from type collectors. Proofs, really presentation pieces, exist for some dates but are very rare. The 1827 proof issues have a special significance in that they are associated with the name Joseph J. Mickley, who is considered to be the "Father of American Coin Collecting." 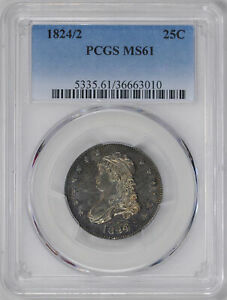 On a visit to the Mint in 1827, Mickley obtained four proof quarters, which turned out to be at least a third of the entire mintage for the date. Although Mint records show 4,000 quarters were produced in 1827, undoubtedly they were struck with another date, as no 1827-dated business strikes are known. After coin collecting became popular in the United States in the 1850s, about a dozen surreptitious restrikes were made of the coveted rarity. The restrikes were made from the original 1827 obverse die, but the reverse used an 1819 die with a flat base 2 in 25 C. instead of the curled base 2 of the original 1827. 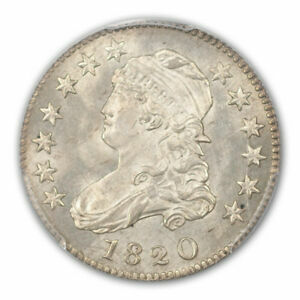 There is also a mystery surrounding the Capped Bust quarter. 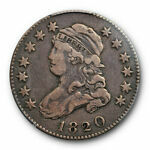 There are pieces, mostly dated 1815 and 1825, that have a large "E" or "L" counterstamped above Liberty's head. 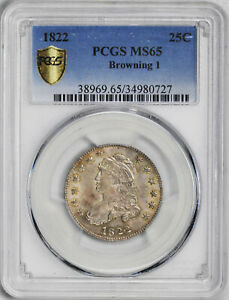 They were first noticed by collectors in the 1870's and were thought to have official origins, possibly as some experiment, but official records show no such counterstamped pieces. The puzzle remains unsolved, although Walter Breen conjectured in 1982 that they could have been made for use as school medals, using the "E" for English and "L" for Latin. Uncirculated pieces must be free of any trace of wear at the hair above the forehead and over the ear. In addition, check the drapery on Liberty's bust and shoulder. On the reverse, the eagle's head and the tail feathers below the shield are the high spots. Some examples come weak or unevenly struck. Look carefully for flowlines on the highpoints of the design in order to determine weak striking from wear. 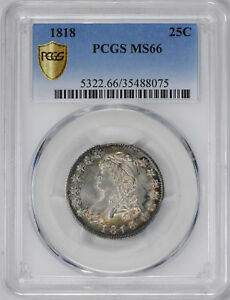 The ending of the Large Size Capped Bust quarter series nearly coincides with the end of the first Philadelphia Mint. The cornerstone of the new mint building was laid on July 4th of 1829 at Juniper and Chestnut Streets. The anticipation of the new mint was an opportunity to refresh the designs of the coinage. In 1831, a smaller size Bust quarter was introduced, which kept the basic Reich design but eliminated the motto E PLURIBUS UNUM . The diameter was reduced to 24.3 millimeters, the size the quarter would remain up through the present day. Bowers, Q. David, U.S. Coins By Design Types, Bowers and Merena Galleries, Wolfeboro, NH, 1986. Browning, A.W., The Early Quarter Dollars of the United States, 1796-1838, Wayte Raymond, New York, 1925.